OTTAWA—With the Bank of Canada’s top economic risk largely eliminated, it raised its key interest rate to 1.75 percent on Oct. 24 and dropped its “gradual approach” with regard to future rate hikes. “The policy interest rate will need to rise to a neutral stance to achieve the inflation target,” said the central bank in its press release. The bank estimates the neutral (equilibrium) rate to be between 2.5 and 3.5 percent; therefore monetary policy at 1.75 percent is still providing a boost to the economy. 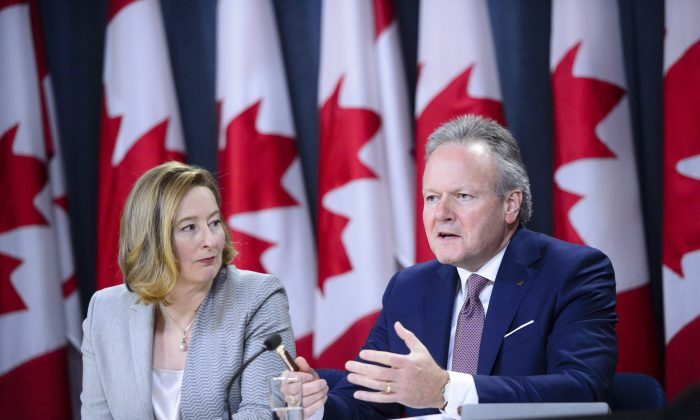 “In effect, every one of our meetings is live,” said Bank of Canada governor Stephen Poloz at the BoC’s press conference. He explained that not using “gradual” in its statement should signal that future rate hikes are not on some preordained path, which has generally been taken to imply one 0.25 percent increase per quarter. That would put the BoC’s key rate at 2.5 percent, the lower end of its estimate of the neutral rate. “With the economy at full capacity and inflation on target, it’s also hard to argue monetary policy shouldn’t be at a more neutral setting,” wrote RBC senior economist Josh Nye in a note. The BoC’s core measures of inflation average 2.0 percent and have been stable for months, although headline inflation has seen some volatility due to temporary factors like a spike in airfares in the summer, a rise in gas prices, and the minimum wage hike. The BoC is more confident in its outlook for the Canadian economy now that the United States-Mexico-Canada Agreement (USMCA) has been announced. It projects the economy to grow at roughly 2 percent until the end of 2020 and operate near its capacity. The new USMCA reduces uncertainty for businesses and could bring greater positive confidence effects for the economy. The BoC upgraded its forecast slightly for business investment and exports in its quarterly monetary policy report (MPR). But trade uncertainty still remains the biggest risk to the bank’s inflation outlook in the form of tensions between the United States and China. “Trade conflict, particularly between the United States and China, is weighing on global growth and commodity prices,” according to the BoC press release. Chinese growth and demand have been a major driver of commodity prices for several years now. Agriculture products and base metals have declined noticeably since July, when the United States imposed tariffs on US$250 billion of Chinese imports and China retaliated with tariffs on US$110 billion of U.S. exports. The bank estimates that the tariffs and their effects on confidence are a drag on global growth of 0.3 percent until the end of 2020—a hit of more than US$200 billion. “It’s why we’ve downgraded out global outlook—to take account of the actions that have already taken place,” Poloz said. Canadian exports and business investment could suffer from a “significant weakening of foreign demand, a breakdown of global value chains, plummeting business confidence, and lower commodity prices,” according to the MPR, should trade tensions between the United States and China escalate causing a global reallocation of capital and labour. The end result could be lower economic activity, although the implications for inflation are uncertain. The bank emphasized that the United States–China trade spat is a two-sided risk. A rapid de-escalation of trade tensions would provide a boost to the United States and China and Canada would benefit. The BoC estimates the net effect for Canada is negative, but small. The risk from trade tensions between the United States and China appears to be bigger for China. The elevated risks in China’s financial sector could mount if policy-makers keep providing fiscal and credit stimulus. According to China Beige Book, corporate borrowing spiked in the third quarter and business investment expanded, yet growth still slowed. “The headwinds facing Beijing are broader and more intense than anything in years,” said China Beige Book in its review of the third quarter. China wants to curtail its mounting debt, but this becomes more difficult when dealing with the trade conflict with the United States, said Senior Deputy Governor Carolyn A. Wilkins. Chinese policy-makers have options to soften the impact of trade tensions, including changing reserve requirements, lowering interest rates, and government spending. “It’s up to them to strike that proper balance,” Wilkins said during the press conference. The BoC reduced its growth forecast for China to 6.1 percent in 2019 and 5.8 percent in 2020, consistent with how it sees China’s potential growth slowing. Chinese third-quarter GDP came in at a reported 6.5 percent, the weakest rate since the financial crisis. Amid the trade war, the yuan is down 10 percent and the Chinese stocks have been down over 20 percent. “Downside risks have increased,” according to the MPR, regarding China. The BoC said the global economic outlook remains solid, even as financial markets are showing signs of malaise. Concerns abound that the U.S Federal Reserve could be raising rates too quickly, global growth is slowing—the IMF downgraded its forecast from 3.9 percent to 3.7 percent—and the trade war is affecting corporate earnings of companies like Caterpillar and Ford. The stock market had it sniffed out—the S&P 500 is down nearly 9 percent in October. But since it last raised rates in July, markets have been expecting the BoC to increase its overnight rate target to 1.75 percent in October. Trade uncertainty has not slowed the economy appreciably, as the bank reported that the economy has been operating near capacity for more than a year. Firms that responded to the BoC’s business outlook survey said it’s harder to find workers and keep up with demand and sales—those interviews were conducted before the USMCA was signed. Now the fate of the Canadian economy primarily rests on how the trade war transpires between the United States and China, though the risk appears small compared to not having the USMCA.